To practice any style of Chinese martial arts one must align with the Six Harmonies. Six Harmonies can be divided into the three fundamental categories of all Chinese cosmology, Jing, Qi and Shen. The jing category of Six Harmonies is usually expressed like this: Wrists match ankles, elbows match knees, and shoulders match hips. The jing category is easy to see in many orthodox martial arts postures because each of above pairs (wrist/ankle etc.) line up vertically. But it is important to understand that the postures ar e not static, they are not held. The postures must have this alignment in motion, constantly. 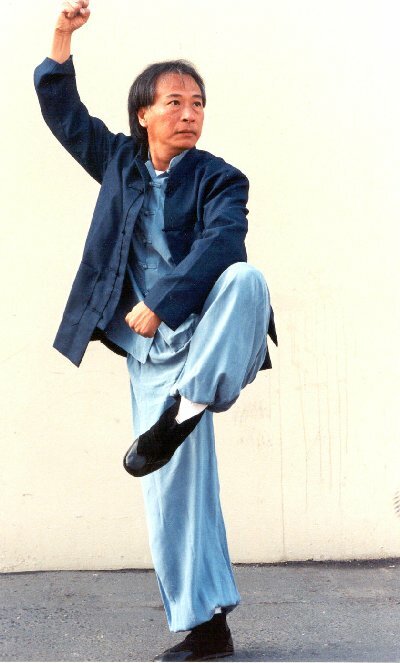 So if you think of a particular posture, say for instance Single Whip in Wu Style Taijiquan, the alignment must be felt not just in the posture but while entering it and while leaving it. So the jing category is often simply thought of as correct alignment. But the jing category in Chinese cosmology cuts across generally conceived categories of Western thought. Jing is not simply one's underlying structure, it is also the origin of that structure. In other words, one's alignment must follow its own developmental pathways. It must come out of, and be informed by, the way we are made--the way we grow and develop form a single cell to a fully formed adult. Thus the rules for correcting alignment are not rooted in the simple pairing of wrist with ankle, elbow with knee. They are rooted in kinesthetic awareness of the most fundamental patterns of a person's growth. The qi category of Six Harmonies is like falling through the doors of perception. A joint can not be seen as a joint. It must be seen as a dynamic animated force. A force which is animated simultaneously in six direction, three planes; up/down, left/right, forwards/backwards. (George Xu calls this Space Power.) When a person animates a joint simultaneously in all three planes, spiral power will naturally emerge. But it is not really the individual joints which take on this quality, it is all the joints simultaneously, it is the whole body as one thing. The ability to differentiate jing from qi emerges effortlessly from the aggressionless feeling of the whole body traveling between movement and stillness as a single thing. Once this differentiation is made, we can move just the one qi, or in better English: move the qi as one. The shen category of Six Harmonies is the process of revealing one's true nature. It is the simple quality of finding one's place. In Daoism we call this returning to the source. The shen category of Six Harmonies is usually described like this: One's mind, body and spirit align with Heaven Earth and the Ten Thousand Things. I hesitate to unfold this one because each of those six terms is a potencial hang up. Should I define them one by one? Will that help? To be full, hollow out. What is worn out will be repaired. having much, you will only be perplexed."